The Spirituality of Francis and Jane is optimistic, balanced, heart-centered, and relational, applicable to many different persons in diverse circumstances, eras, and lifestyles. It has weathered the test of time well and continues to inspire us today. God often sends others to help us along our path to holiness. 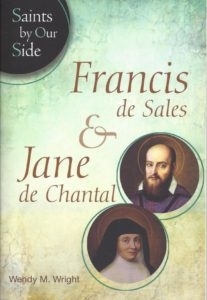 Through the unlikely friendship that developed between Jane de Chantal, a young French widow and mother, and Francis de Sales, a bishop in sixteenth-century Geneva, two of the Church’s great saints were formed. And even today, the fruits of their personal holiness and spiritual friendship shed light on our own spiritual journey. Featuring reflection questions, a chronology of important dates, and a prayer, each Saints by Our Side biography will introduce you to compelling models of holiness and intercessors in our needs.